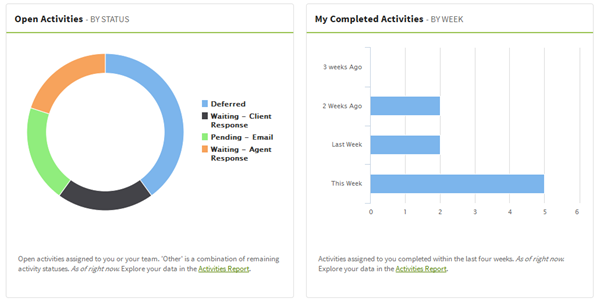 The Activities Dashboard is where you are able to see all of your open and recently completed activities. Sort, filter, and search for activities in your Activity List to accomplish tasks quickly and efficiently. Understand your open activities and productivity using the activity graphs. Track incomplete activities assigned to you and your teams. Track activities that were completed in the last 7 days or 4 weeks. View related client and policy information. Quickly get a view into what is going on by using the open and completed activities graphs. All of your open activities are shown by status to give you an idea of where things are at in your to-do list. Additionally, check out your productivity from the last four weeks.